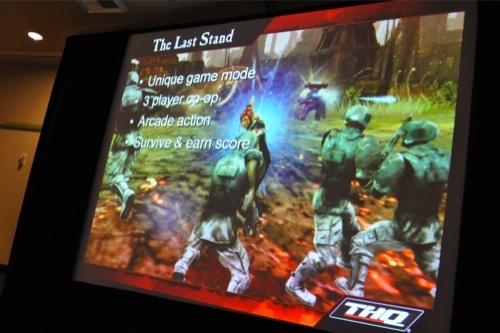 Dawn of War 2's free update goes live on Wednesday, and with it comes a brand new survival mode called The Last Stand. If you read our preview from PAX and checked out the video, you know what to expect. Three players team up and face off against 20 rounds full of enemies and surprises. What's more, players can level up their character and unlock unique items and bonuses for use in the game. To celebrate the launch Relic is holding a contest where you can win a signed poster, a miniature, and a t-shirt. The only thing you need to do is reach and complete wave 20! And in the true spirit of co-op, each member of your team wins the same prizes. So while the update goes out on Wednesday, we're going to be hosting a special Games for Windows Co-Op night for this on Friday. Things should kick off around 9PM EDT. We've got an event posted on our Steam page for this, and we'll be using it to coordinate meetups! Hope to see you there - we may even have some prizes of our own to give away!